There is no agreement on the origin of the three-monkey motif. Is it from India, China, Korea, or Japan? 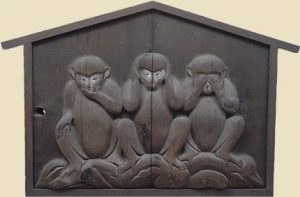 This site assumes that the three-monkey motif is an innovation attributed to Japan‘s Tendai sect. 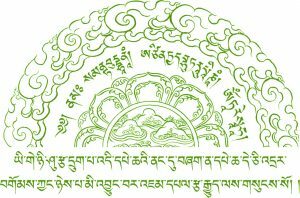 The motif may have developed from the Three-Kami-Three-Buddha-Formula of Japanese Tendai Buddhism at Mt. Hiei, or possibly from the core Tendai principle of triple truth 三学, i.e., (1) all things are void and without essential reality; (2) all things have a temporal or provisional reality; (3) all things are both absolutely unreal and provisionally real at the same time. Alternatively, the three monkeys might represent the Three Truths of Buddhism, which are: (1) life is suffering; (2) suffering is caused by our desires, and; (3) eliminate desire and thereby eliminate suffering.